A common archetype in children’s fantasy is the lonely child escaping her ordinary life to explore a fantastic world. Examples include some of the most famous works of children’s literature: Alice in Wonderland, The Phantom Tollbooth, and The Wizard of Oz. The character braves various dangers, maybe saves the world, and finally returns to everyday life. The 2007 Flash game “Anika’s Odyssey” is a enjoyable, bite-sized incarnation of this familiar plot. 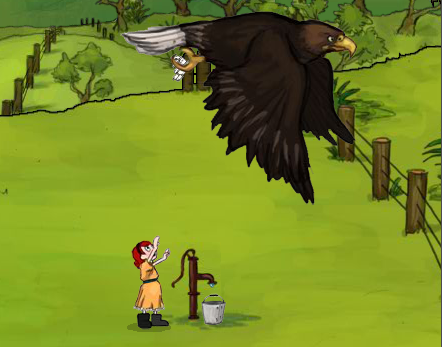 1 Anika is sent to fetch a bucket of water, when a huge eagle swoops down and steals her stuffed rabbit. Players must click their way through various puzzles to guide Anika across a sprawling canvas populated with characters reminiscent of Maurice Sendak. And I mean a canvas — rather than having levels, the game is one large picture that the player scrolls around. Although the story is simple, it’s told well and complements the simplicity of the gameplay. It would make a great “My First Puzzle Game” for kids who are tired of the unimaginative games often foisted on them. Not even casual gamers will be stumped by the puzzles, but they are interesting nonetheless for how they contribute to the storyline and overall atmosphere. After watching Anita Sarkeesian’s video on the “damsel in distress” trope in video games, I can’t help but appreciate that the game’s protagonist is a young girl. Anika is the typical silent protagonist — rather like Portal’s Chell — and we don’t get to know her much, at least not in the traditional way of learning her backstory. But it’s great that young girls have a protagonist who looks like them. Despite Google suggesting I search for “anika’s odyssey 2,” there’s unfortunately no sequel. Creator Jeff Nusz has made more games, including another under the “Tricky Sheep” label, “Kaleidoscope Reef”, but it isn’t the same kind of puzzle-adventure game that Anika’s Odyssey is. “Sprout” is more like “Anika’s Odyssey,” but features even less plot and has a more minimal aesthetic. Despite neither being as good as “Anika’s Odyssey,” they’re worth playing. The game isn’t long, but it is rewarding. Although it doesn’t give satisfaction of solving tricky puzzles, it tells a good story and features a mesmerizing world. “Anika’s Odyssey” shows that Flash game developers can create fantastic worlds with the best of them.